My lovely friend Naomi very kindly nominated me to do the ALS ice bucket challenge this week. And the great thing is that I still love her! I have to say that I was really dreading it because I don’t fancy the idea of ice cold water being poured over my head. It was bad enough that I had to do it to myself (yes, I am a big chicken) – and it would have been so easy just to opt out and say no thank you, I’m not doing it! I had to really think it through before I did it – some people are spontaneous and will just take up any challenge without hesitation; some people are more cautious; others, like me, have to do it in a more creative way because they don’t want to just do it like everyone else. And others (yes, like my husband) just don’t do it – and they all have their own reasons for not doing it. There is space in the world for everyone, each with their own special way of doing things. If you don’t feel that you “fit in”, you need to make a way to do things in a manner that suits you without feeling pressured to follow the crowd or do things ‘according to the norm’. If that is not you, it is not you! Be proudly different. Sometimes you need a bucket of ice water poured over your head! And I don’t mean that you literally have to pour water over your head but a good wake up and shake up is not a bad thing! You can watch thousands of ice bucket challenges on social media and the majority of people are forced to take in a deep breath or scream when the cold water hits them. Just take a deep breath and move forward. For the people who found the challenge difficult for their own reasons (for me it was not liking the idea of being cold, for my son it was being shy when it came to filming his challenge) – it took bravery to take on the challenge. Everyday when you wake up and face the world – do it bravely. Tell yourself, “today I am going to be brave and I am just going to do it” and you will! One of my favourite things about this Ice bucket challenge was that it united people. It is amazing to see how many people all over the world of different cultures and religions, different life stages and beliefs, are all taking up the challenge. It is has a real feel good factor (even beyond the awareness of a terrible illness). It is good to remember to celebrate what makes you unique but to also celebrate our many similarities. And we could all use a bit of that these days. Probably the most important thing for me doing the challenge was for my own mission of bringing more awareness about depression. Depression makes you feel frozen – it numbs you and it is not something that you can “just snap out of”. I really encourage anyone who is dealing with depression to use the ice bucket challenge to make your point too. It is remarkable how true this is. Sometimes it seems that we can do nothing right. No matter what you do, there are people that you are just not going to please, and there are people who are going to criticise you for whatever you do. And even if you do succeed in what you are doing, you may still be the ‘wrong’ race, the ‘wrong’ religion, the ‘wrong’ gender in somebody else’s opinion. You might be too slow, you could be too fast, too fat, too thin…. First of all you need to understand where that criticism is coming from. Is it really about you? People who are unhappy with themselves will always criticise others to make themselves feel better. Know that the majority of the time, it is about them and not you. Then, you need to take a good look at yourself and if you feel that you are doing the right thing, you need to keep doing it, no matter what anybody else says. And if you are doing the wrong thing, maybe you need to do the wrong thing your way because that is that only way that you are going to learn – from forging your own direction rather than just taking everybody else’s advice. We live in a world that is so strongly influenced by media and social media in particular. 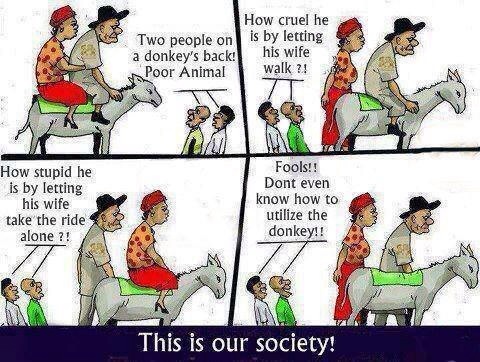 But most of what you see is just an edited version of somebody’s life and opinions. People are only going to show their best pictures and tell their best stories because they can. That means that instead of getting upset because your life is not “up to standard” compared to others or you are not doing the same as others, think about yourself and what you are trying to achieve and what you are all about. You are far more intelligent, way more beautiful, and abundantly more blessed than you realise! This week, we were all so saddened to hear about the death of Robin Williams. It was even more poignant because of the way that he died. I read a brilliantly written piece that said that he didn’t die by suicide, he died from depression. I think that people often don’t realise how devastating depression can be and the one legacy that Mr Williams will hopefully leave for us is not just his amazing comedy and acting ability but also for more people to understand that depression can affect everybody and anybody. If a person looks happy and well on the outside, we have no idea what is going on inside. Hopefully this will raise an awareness and increase tolerance. The one character that Mr Williams played that will probably be the one that I will remember him most for was Patch Adams. Particularly because that inspired me to learn more about Patch and eventually I had the great opportunity to meet him a few years ago. Patch Adams was one of the people who inspired the idea of laughter being the best medicine and through his clowning (and medical) skills, he has done amazing work. If you haven’t seen the movie, or heard of Patch Adams, have a look at this great clip here. In these difficult times, we should be laughing more. I know that sounds like a contradiction! No, you shouldn’t laugh at your problems – they are not funny. But you should find laughter in other things. On Wednesday, I was in a bad mood and I was tired and all I wanted to do in the evening was have a nice bath and get into my pyjamas and hibernate. My husband had other plans, and he convinced me to come out with him to a comedy club. After moaning in the car all the way there about how I would rather be at home in my pyjamas, I had an amazing evening. More than anything it was because I just spent the evening laughing and it was so good for my soul. Please try to find the laughter, be good to your soul – no matter how tough things are, there is always something to smile about! Share a joke with somebody, browse the comedy sites online, visit a comedy club, watch a funny movie. Life is serious enough already! One of the reasons that we live in South Africa, at least according to my kids, is that it is a really safe county. Before you laugh at that statement (yes, I’m aware that I live in one of the murder capitals of the world), my kids are talking about living in a place where you are highly unlikely to be affected by a natural disaster. So, no tornadoes, hurricanes, volcanoes, tsunamis or earthquakes for us. Or so we thought, until this week Tuesday when our world was rocked by an earthquake in Johannesburg. We were truly blessed to have no damage to our home at all so it was actually a bit exciting because we had never experienced anything like that before – riding the shaking floor. And of course, because this is me, some lessons had to come out of it. Most importantly, and on a very practical level, I’ve just read bad news after bad news articles and suddenly, the earthquake gave us something else to talk about. It seemed to diffuse some of the tension in the air. Things literally shifted. There was great excitement and a common subject for everyone to talk about. No matter who you are or what your story is, the conversation was suddenly about everyone’s personal experiences. One of my son’s greatest fears is earthquakes and we always tell him not to be ridiculous because there is no way that there is going to be an earthquake where we live. It left him quite traumatised but now he is walking around feeling like a hero who survived something ‘terrible’. Most people’s fears are about the unknown and we have no idea of how we would cope if our fears were realised. But there is really no purpose in stressing about the unknown. It is exactly that: the unknown. If it happens to you, you will deal with it when it happens. You can have all kinds of plans about what you’ll do but you will never know until you are in it. And you would probably never have guessed that you would have the ability to survive the unthinkable. I know this sounds terribly cliched but sometimes you need to be shaken, to be jolted into doing something different. It is more than easy to stay in your comfort zone and not try anything different. For those who are not brave enough to take risks, life is somehow going to find some way of throwing those risks at you. And you know something? You are going to be amazing when the shaking stops and you see a clear path to your new destination. July is over and it has been a really busy month for me. It was Mental Health Awareness month and it has been filled with talks, meetings and events. What I really hope comes out of all of this is that people become more tolerant. Sometimes this world seems like it has gone crazy because there is so much intolerance. And it is bad enough that intolerance is based on religion, race or gender. But then added to all of that nonsense, there is intolerance based on a person’s illness and disability. That intolerance is what really frustrates me. Just last week, another one of my patients lost their job because their employer was not prepared to help them by finding employment that is better suited to them (and by the way, in South Africa, it is law that employers need to find suitable employment within their company if a person is no longer functionally able to do their previous job). And when I say patient, I’m not even meant to use that word. We went from working with patients, to clients to mental health users! But it doesn’t matter what word we use if those people leave our support and go into an environment where they get little or no support from others. I can certainly try to change things, and I always make it my mission to fight for the rights of my patients and to educate others in understanding mental health. But the best people to do this are the ones who have been diagnosed with a mental illness. And there’s a good chance that it is you, or somebody else that you know and love. There is nothing better than being the person who is diagnosed with bipolar mood disorder, depression or anxiety saying out confidently that they are ok with their diagnosis and are not only capable of coping in the world but are able to do even more than that. Because you are strong, resilient survivors! This morning I met a woman who had been diagnosed with a mental illness and who really battled to get the support that she needed. So as soon as she was stable enough, she set up a facility that would provide others with the care that she so badly felt she needed. That is a brilliant success story. And it doesn’t have to be limited to just her. Or to just the brave ones out there. Everyone of you has such potential no matter what is “wrong” with you. When you break through all of the barriers and negative expectations that others have of you, you are truly going to be brilliant.